If you need a multifaceted law firm in the Belle Chasse area, do not hesitate to contact Ballay, Braud & Colon, PLC. We have extensive experience guiding a broad array of clients through a wide range of practice areas, from personal injury to business formation. Since 1980, the law firm of Ballay, Braud & Colon, PLC, has garnered significant expertise in a variety of legal matters representing clients as both plaintiffs and defendants. Our attorneys are dedicated to serving our clients in an aggressive manner while providing personal attention and individual attention. Clients trust us for honesty, prompt communication and a realistic assessment of their cases - and we strive to exceed their expectations at every stage of the legal process. Whether you have concerns regarding personal injury cases, medical malpractice, business formation, corporate litigation, real estate matters or any other related practice areas, we encourage you to contact the law firm of Ballay, Braud & Colon, PLC. No matter the complexity of the case, our attorneys will approach it with the same tenacity and attention to detail that has served us well for more than 30 years. Do not hesitate to contact Ballay, Braud & Colon, PLC, to schedule a confidential consultation with an experienced lawyer. By carefully examining the facts of the case, we can determine who and what caused your accident. At Ballay, Braud & Colon, PLC our attorneys will then work with the at-fault party's insurance carrier to come to a beneficial settlement. 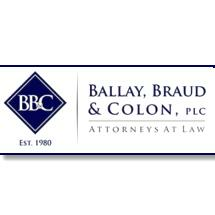 Ballay, Braud & Colon, PLC has been representing victims of medical negligence for more than three decades. Whether your situation involves prescription errors, surgical errors, or birth injuries, it is important to contact an attorney. Since 1980, we have protected the rights of seamen and fought for the maximum compensation possible for injured clients. We understand the stress and strain you feel as you try to provide for your family following a serious injury. At Ballay, Braud & Colon, PLC we understand the delicacy that some people want to approach the drafting of a will or creation of a trust. Clients rely on us for personal service from start to finish. In the Gulf Coast, we have our share of natural disasters. The attorneys at Ballay, Braud & Colon, PLC will fight on behalf of their clients to ensure they receive the full and fair compensation from their insurance carriers.